No, I'm not saying that you should become acquainted with a dictionary. 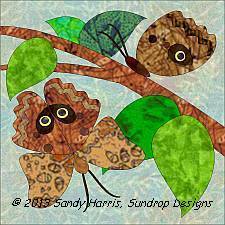 Webster and Oxford are the new butterflies joining the Sundrop Critters. They're owl butterflies and really do resemble their namesake. Since owls are suupposedly wise, I gave my owl butterflies scholarly names. This applique pattern fits a 6" block or larger and is available for free on my web site (www.sundropdesigns.com) until Oct. 15, 2013. Afterwards, it can be purchased for $2.00. My internet problems have gone from bad to worse: speed that slows to a standstill, pages that load looking like preschool html gobbledy-gook, and frequent disconnections (like every 10 minutes). I've unplugged everything three times to take my laptop to my sister's to use her dsl to troubleshoot. The good news is that my computer works prefectly fine on dsl, so there's nothing wrong with my laptop. The bad news is that after trying several different browsers and isp's, the only one I can get to work is AOL and it crawls at 31000 kbps. But at least it's moving and eventually uploads pages in a readable format. As if things weren't bad enough, when I went to SundropNews today to send out a newsletter, I discovered that it has been chosen by the Yahoo powers-that-be to be a guinea pig (slang term meaning test subject) for Neo. Aaaargh! I clicked on every button I found but could not find a way to post a newsletter. So, until Yahoo works out the many bugs in Neo, I will post things here, and on my web site and the SundropFun group, and hope everyone somehow gets the message. Item #2: When I was compiling my Sundrop Critter patterns into annual packs, I discovered that I had miscounted - I'm short one critter! I also decided that I don't want to use my special occasion critters, like the Easter Bilby, as part of a pack. So get your printers and stash ready because six more critters are coming! The first should be arriving this weekend (if the internet cooperates).